Call anywhere from anywhere with one card and save! Built-in PINless feature and special address book. Multiple and flexible access methods to make calls from wherever you are to anywhere worldwide, on any devices! Quick and easy calls from landline, cell phone, smartphones, tablets, or computers. Call from iPhone, iPad or Android worldwide over Wi-Fi/3G/4G. 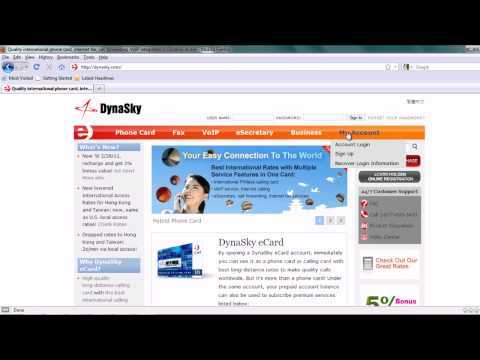 Call using DynaSky Phone for PC or Mac with Internet. DynaSky eCard is not your average phone card, calling card, or prepaid long-distance provider. We couple the best international long-distance rates with a suite of convenient features other companies just don't offer, which has made us a trusted leader in low-cost international calling since 1996. Use our new Global Callback Feature when your travel abroad, or tell your overseas family and friends about it, and let everyone save on international calls! New DynaSky VoIP App smartphone and tablets to make Wi-Fi calls worldwide. Apple and Android versions available for DynaSky broadband access.